On Tuesday night, he woke up with a textbook croup cough, so I was up for an hour or so alternating between steamy bathroom and taking him outside to breathe the cold air. Good news: it went away and he was able to sleep. Bad news: I left the door unlatched and it swung open after I went to bed so the furnace broke down trying to keep all of New England at 68 degrees for the rest of the night. He was okay on Wednesday, but woke up at 3 AM on Thursday with really labored breathing and a new kind of cough. We spent a few hours there and did a few breathing treatments with the nebulizer, and when that didn't do anything, we were sent over to the E.R. Actually, he did pretty well considering that he hadn't really slept and we were there for so long. The angriest he got was when the tech took his Cheerios away to do the chest X-ray. Anyway, in the end it turned out fine. His breathing calmed, they sent us home with enough medical paraphernalia that my kitchen looks like an illegal pharmacy now, and he's sleeping as I write this. Parenthetically, Phillip just got a promotion and a raise at work which is nice, both because of this whole visit coming right out of our pocket (our HRA has run out for the year) and because of heating the whole neighborhood after the door got left open. 9yo: "If you are what you eat, you're a cannibal." 11yo: "But the people you eat have to be cannibals too, then, or you're not a cannibal." 9yo: "Right, they'd have to be. And if they're cannibals already then it means they eat other cannibals." It's like critical thinking for the criminally insane over here. Earlier this week we went to a Christmas party. We had dinner, sang some fun Christmas songs, watched the kids do a Nativity play, and we got to see Santa. My 3-year-old, who is usually shy in public, surprised me when it was his turn by running with open arms into Santa's lap and yelling, "Hi, Santa!" To be fair, Santa was being played by our family friend Jessica, but I don't think he knew that. And yes, you read that right: Jessica. I still need to ask her how that came about. Nevertheless, she did a great job, even if she did have one too many X chromosomes. We got a package full of pre-wrapped presents from Phillip's parents. Usually all the grandparents have the Amazon packages sent to us and then we wrap them, but last year it got a little out of hand so they took pity and wrapped them at home before sending them to us. 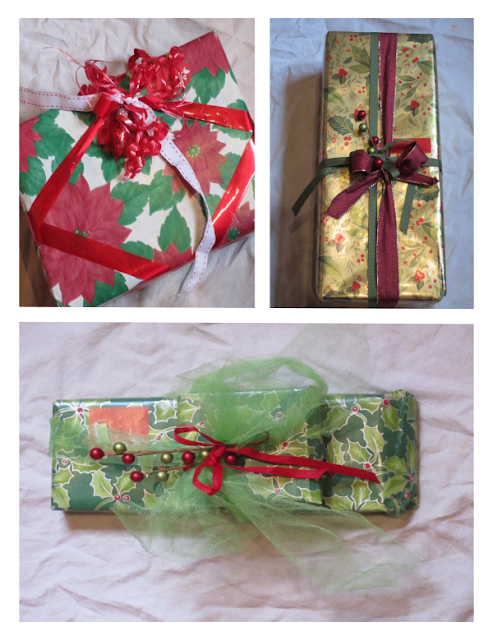 They claimed it was to save labor, but it also may have been because we wrap ugly presents and theirs are way prettier. Slightly smooshed from being shipped across the country, but still pretty. And ours have 'to' and 'from' written directly on the wrapping paper with a Sharpie. For more details, please see this shocking tell-all article and that should make you feel plenty better about however you wrap gifts at your house. This nervous breakdown is brought to you by: Scholastic. This is a joke, right? Different coins? Silly hats? Crazy socks? I have to know what day of the week it is today? I'm sorry, but there's no way any of that is happening. 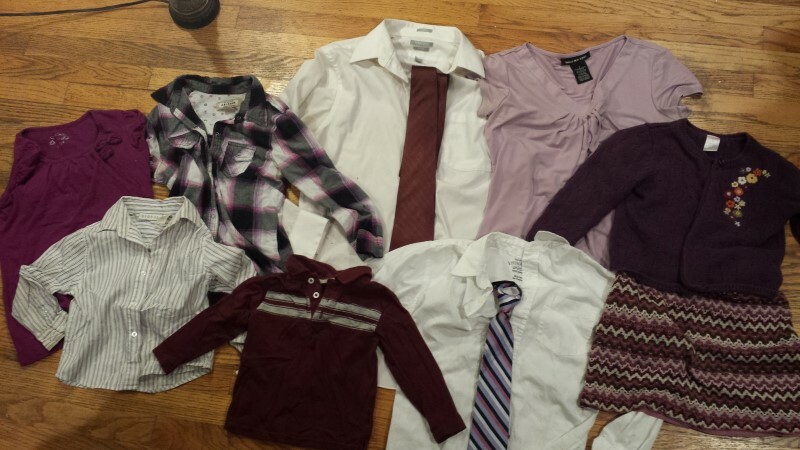 Last week you all helped me out by voting on what my family should wear to family pictures. Palette B won the vote! We scheduled the shoot and planned to meet Phillip at the studio after he got done with work. He was on time, but I grossly overestimated my ability to get the kids ready on time and we were 14 minutes late. I know it was exactly 14 minutes late because they told Phillip we had until 5:00 before our shoot would be cancelled, and in typical Evans fashion we came rolling in precisely one minute before that deadline. The funniest part of the shoot was afterward, when an employee sat down with us to order cards, looked at our 6 kids, and asked me, "Are they all yours?" No, I just like to sneak random strangers into our Christmas cards sometimes to see if my extended family members are paying attention. I have a friend who every year has one random person in their Christmas card. They have a very dry humor personality. So it is kind of funny to see what they come up with. Maybe it wasn't that silly of a question, then! Ugh, CROUP! I'm sorry! Gracie had that pretty bad a few months ago, and then a mild case of it a few weeks ago. She's battling a sinus infection now, and every now and then I hear a barky cough and my heart starts hammering. Just your headlines are enough to make me guffaw!! The cannibal conversation will be a classic in the years to come! 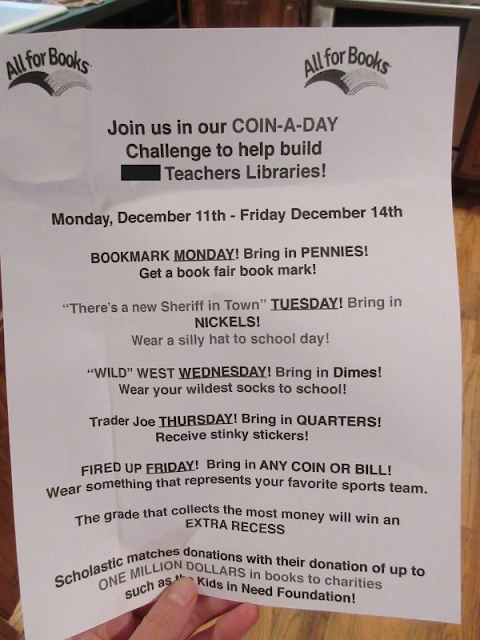 Just send in some random coins, and let the kids do ALL.the.things. on whichever day you remember to do something!! They already do this mess in VPK!! And I do want to scream!! The palette B was a lovely choice. Sorry to hear baby was sick. Glad to hear he's better now. YAY a raise! Boo that it was all absorbed in necessary expenses! Oh man, I'm glad he's okay! What an adventure. I like all the outfits! So funny though: "All they all yours?" I mean???? If you don't have one already, I highly recommend the pediatric Dragon mask to use with your nebulizer. Hands free and then the kids get to "breathe smoke" like a dragon while they take their treatments. Makes something miserable a little better. What a coincidence, we also got to visit our local ER this week...not needing a nebulizer but I saw a toddler getting a nebulizer treatment there so that must be a really popular activity these days.